The 2012 Olympics are almost upon us, with the spectacular opening ceremony set to take place on July 27th, featuring a cast of 10,000 volunteers who will be re-enacting typical British countryside scenes in a breathtaking £27million ($42.3million) performance complete with meadows, rivers and, of course, some English rain! If you’ve been lucky enough to get hold of tickets to this year’s games, you don’t want to follow such an awe-inspiring day with a night in a hotel that’s not quite so spectacular. If you want to immerse yourself in British culture, take a trip to this flamboyantly-decorated hotel in the fashionable quarter of Clerkenwell. It’s a good one and a half hour walk from the stadium, but well worth the journey. You can take the underground too, but it’s not recommended during the expected crowds! After sleeping in the grand English beds and taking a shower in the room’s deluxe bathroom, you can nip downstairs for a British breakfast classic, salt beef hash, to fuel you for the big day ahead! Britain is famous for its eccentricity and nothing sums that up better than this bizarre-yet-beautiful hotel in Stepney Green, which has only two rooms available, of which just one is for couples, so book quickly if you’d like to stay here! Aside from the over-the-top, lavish decor that is more artwork than interior design – think lion’s head taps, plenty of sculptures and high-backed dining chairs that look like something from Alice in Wonderland – you can only participate in the equally eccentric evening entertainment such as a classic tea party or sit in your pyjamas and have a bedtime story read to you! Yes, you read that right! 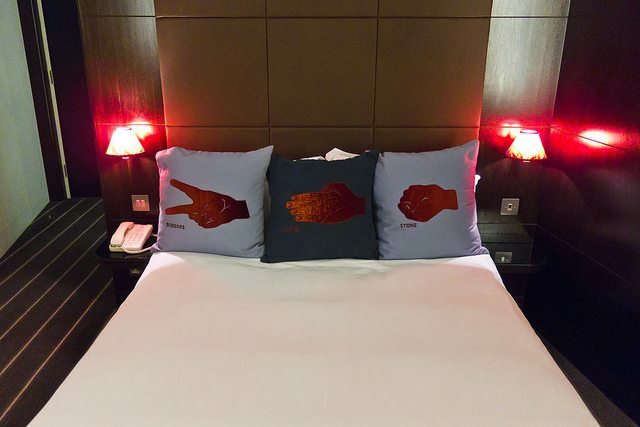 Situated just over an hour’s walk from the Olympic stadium, this budget-luxe hotel is famed for its regular £1 sales – sign up to the Hoxton Fan Club to make sure you hear when room prices drop to this ridiculous rate! If you’re not quick enough to snap up one of their £1 rooms you can still book as usual with prices from a very reasonable £59 ($92.50). In fact, it’s probably the most luxurious inner-city hotel you’ll ever stay at for this price! You’ll get a simply but beautifully furnished room, a modern shower installation with heated mirrors that won’t get steamy and even 1 hours of free international calls per day so you can call home and tell your friends how much fun you’re having! Already-overcrowded London is going to get absolutely packed when the Olympics arrive, so if you’d rather escape from the hubbub of the town centre at night and head somewhere a bit more rural to relax, this grand English manor is the perfect choice for you! It’s a little over an hour’s drive from the stadium, but once you arrive you’ll feel like you’re miles and miles away, right in the heart of the English countryside! Built in the 16th century and surrounded by picturesque gardens and an ancient moat, guests will feel like they’ve stepped right back through time. No need to be alert, electrical amenities such as a modern power shower and TV are all available too! Contrary to popular belief, we’re not all old-fashioned in the UK! If you fancy taking in some traditional British decor but in a much more modern setting head to the Dorset Square for contemporary rooms complete with built-in docking stations for your iPod! When you’ve had enough of your modern room you can head downstairs for some more classic English delights such as afternoon tea, or just sit and relax in the luxurious drawing room by the fireplace! Which of these London hotels will you be staying at for the 2012 Olympics? About the author: Gavin Harvey is a dedicated personal trainer whose thirst for adventure has taken him around the world. After a gap year in Australia he developed a serious case of wanderlust and is always searching for the next adventure, as well as the latest gadget. He is currently renovating the home that he shares with his partner and two cats.